Found it in 'Travels in the Mogul Empire' by Francois Bernier, edited by Archibald Constable (1891). Francois Bernier (1625 – 1688), French physician and traveler, visited Kashmir in 1664–65 as part of Mughal Emperor Aurangzeb’s entourage. He is regarded as the first westerner to have described Kashmir at length. 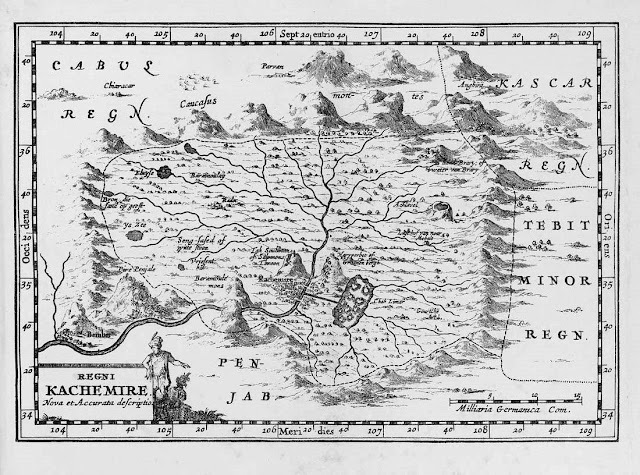 A map, based on Bernier's description of Kashmir, was first included in the Dutch version of his travel account published in Amsterdam in 1672. Irving Brock in his 1826 edition of the book (re-edited by Archibald Constable in 1891) noticed that the map was 'curiously incorrect' and added 'a new and accurate delineation' . The map here is the new one. Description: This original old antique print / plate originates from the fifth volume of: 'Atlas Historique...' (Historic Atlas...), Published by Zacharie Chatelain, Amsterdam, 1732. The atlas was published in seven volumes between 1705 and 1720, with a second edition appearing in 1732. The maps were accompanied by information pertaining to cosmography, geography, history, chronology, genealogy, topography, heraldry, and costumes of the world. The maps in the Atlas Historique were mainly based on those of the French cartographer, Guillaume De L'Isle, but were presented by the Chatelains in an encyclopaedic form. Artists and Engravers: Made by 'Henri Abraham Chatelain' after an anonymous artist. Henri Abraham Chatelain (1684-1743), his father Zacharie Chatelain (d.1723) and Zacharie Junior (1690-1754), worked as a partnership publishing the Atlas Historique, Ou Nouvelle Introduction A L'Histoire under several different Chatelain imprints, depending on the Chatelain family partnerships at the time of publication.